The super fun challenge for Free for All is to use something in your garden. I have flowers and sunshine in my garden. I added some sunshine and flowers for my garden items to my Green Duck embellishment. I love these little embellishments they make really fast cards. The sunshine is sprayed with red, orange and yellow through the Tim Holtz sun rays stencil. 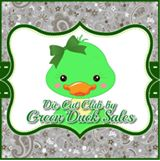 Then the cloud and the green duck embellishment are popped up on dimensionals. The hills are die cut with a stitched border and then I finished off with some flowers and liquid pearls. I love your sun rays behind that cute Statue of Liberty........I never thought to use a stencil for my sun rays. And the green hills just top it all off with perfection.